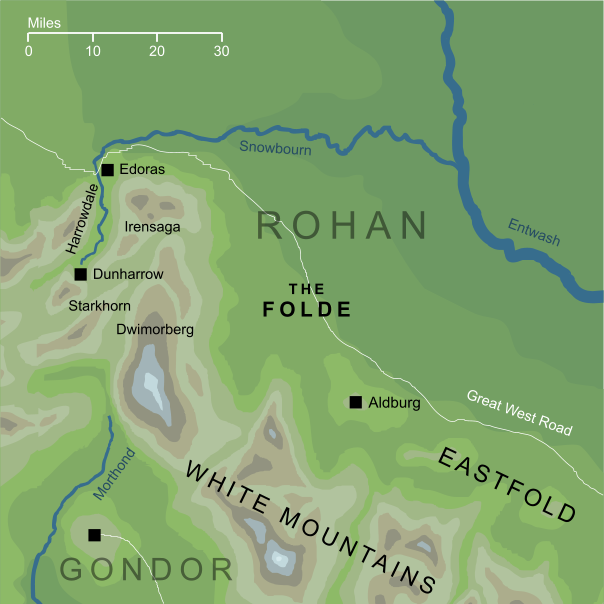 An ancient and historic region of Rohan, close to the King's courts in Edoras, which indeed originally held the King's seat at the town of Aldburg. Its name comes from Old English, with the approximate meaning 'bosom of the Earth', which shows its importance in Rohan's early history. The geography of the map shown here is almost entirely established in canon, with the sole exception of the town of Aldburg. We know that it was within the Folde, and that it stood on a hill, so it must have been close to the point marked on the map, but its precise location is not known with certainty.